I wanted to share my quick and easy DIY Cheshire Cat Costume! I love this costume because it’s very comfortable to wear and cute. Also, you can get it in just about every color imaginable! Now, I shopped my closet to put together this costume, so you may want to do that for some of these items. If you don’t have some of them, you can pick them up on Amazon or Etsy. I used Pawstar items because they handmake them in whatever colors you want, which I wholeheartedly love. If you follow me on Instagram, you’ll know that I saw Pawstar at Dragon Con and bought one of their cute turquoise blue furry hoods. 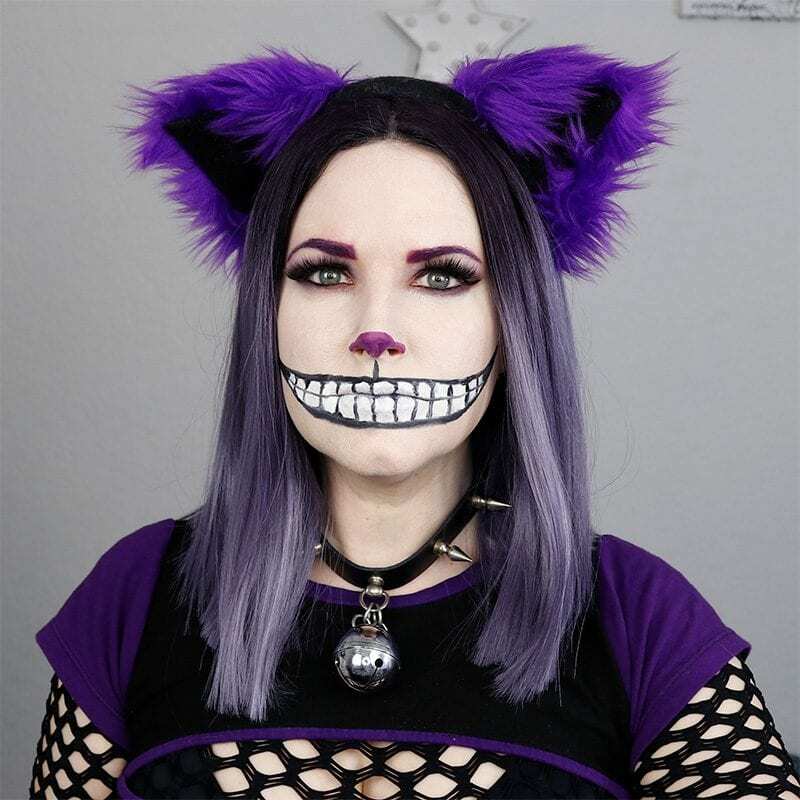 Follow my friend Emily Wolf Beauty’s tutorial for the DIY Cheshire Cat Makeup. I think the makeup is really what makes this costume so cool! It was my first time attempting her tutorial and I think it turned out nicely! First you need to decide on a color for your DIY Cheshire Cat Costume. I went with purple and black, which I’m sure is no surprise to you! However, they have just about every color under the sun available, so you can choose your favorite. Now, I wore a purple lace front wig, but you don’t have to do that unless you want to. I love wigs and this one is my all time favorite! Pawstar Purple Cat Ears are so cute and fluffy! These are what I wore. The matching Pawstar Purple Cat Tail is pretty cute too. I love this tail on me. It easily fits onto any belt you own. If you prefer the classic Hot Pink & Purple or the newer Turquoise and Grey Cheshire Cat stripes, Pawstar has those too! I keep thinking about picking up these sets because I love the colors. I also think the turquoise and grey would look great with my current hair color. I also have the purple Pawstar Fingerless Gloves. I think the big bell collar I have really makes the outfit. If you love spikes the way I do, you’ll want the spiked collar with a bell. While I don’t have these, I do have several friends who love the Pawstar Furry Leg Warmers. I have several different fishnet tops in my wardrobe. Any of them will work with the costume. There’s also a large fishnet top like I’m wearing too. If you prefer to make your own cat ears and tail instead of buying them, here’s a great tutorial on how to make your own cat ears. In the past I’ve made my own cat ears and tail with help from a friend. We stuffed them to make them ridiculously thick, too. You can see how cute Ray and I look together in the photo above. He has a Mad Hatter costume that he loves to wear, which consists of a purple velvet hat, a purple velvet jacket, and a white poet shirt. Everything I wore to complete my DIY Cheshire Cat Costume. What do you think of my DIY Cheshire Cat Costume? What color would you choose?